Fresh off a wagon train from Rockstar's NYC headquarters, a passel of Red Dead Redemption 2 previews have wandered in off the dusty trail. Journalists from a variety of major outlets were invited this week to play some of Red Dead 2's story missions. A sequel to the highly successful Red Dead Redemption (itself a sequel to the less successful (but we enjoyed it) Red Dead Revolver), RDR 2 takes place in 1899, the tail end of the Wild West. You play as Arthur, a member of "Dutch's Gang." "When I approached the gunsmith's shop - which sits across the street from the church, as it happens - I noticed two men in conversation on the porch," writes Samit Sarkar at Polygon. "I walked up to the pair, and one of them said to the other, "Hey, this is the guy I was telling you about!" The man explained to his friend that after he was bitten by a snake the other day, I had come across him and had saved his life by sucking the poison out of the wound. (Presumably, someone playing the game before me on this save file had actually done that.) Then he told me that I could walk into the gun shop and grab one item for free as a token of his gratitude." Red Dead Redemption's contribution to the world was the grafting of a classic Rockstar-style narrative to the long-forsaken genre of "Wild West video games." It was an open-world, horse-ridin', deer-skinnin' adventure replete with gunfights, steam trains, and stagecoaches. The sequel aims to bring more of the same but even better. "[W]hile Red Dead Redemption 2's shooting feels mechanically similar to the original, the look and communication of impact appears to have been heightened - screen shake was more pronounced with each shot, the sound of discharges was satisfying. 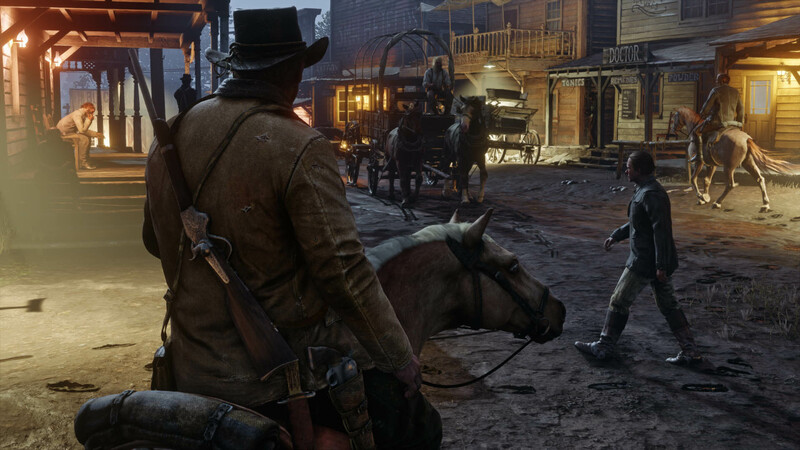 It's also notable that in Red Dead Redemption 2 you can physically see all your weapons on Arthur's character model - you can hold only hold two sidearms and two long weapons (along with a knife, lasso, and throwables), and when switching from a rifle to a sidearm Arthur would simply hold his rifle in one hand while he aimed his pistol with the other. Dual wielding is also an option later in the game." "At this point, Rockstar's dedication to the control scheme favoured in Grand Theft Auto V (and most of their previous games) could be seen as obstinate in the face of many action games having you click a stick to sprint, but Red Dead's increased physicality is a deliberate choice to connect controller and character. A take it or leave it offer from the developers that, if nothing else, is in strong keeping with its goal to keep you grounded in Red Dead Redemption 2's extraordinary world. And while third-person seems the natural way to play a Rockstar game, the first-person camera introduced in the 'next-gen' upgrade for GTAV makes its return, should you wish to look straight down the barrel." "When Rockstar set me loose in the Heartlands, I just rode around for a while to try to take it all in: the grass swaying in the breeze; the sun shining over the two towering bluffs in the distance; the thunderstorm that came through in the evening and left puddles everywhere; the Milky Way illuminating the night sky. My location amid rolling hills provided a terrific vantage point from which I could see a grand view of the idyllic countryside before me - it was like I was gazing into a landscape painting from the Hudson River School. "But a gorgeous virtual world doesn't quite feel like a living world until you put humans (and, in this case, animals) in it. The most exciting element of that stunning vista was the people I saw crisscrossing the landscape on horseback or in a carriage - and the idea that I could gallop over to each person and have some kind of interaction with them that might be unremarkable, unforgettable or anywhere in between. Just like in real life." Red Dead Redemption 2 releases Oct. 26 for PlayStation 4 and Xbox One. Breathe. Reach out with your feelings and realize you're making way too much Star Wars. Bob Iger, Walt Disney Company CEO and financial steward of almost all prominent 20th century pop culture, confirmed that the company is going to slow down on producing more Star Wars movies. "I made the timing decision, and as I look back, I think the mistake that I made - I take the blame - was a little too much, too fast," Iger told the Hollywood Reporter about the decision to stop flooding the Star Wars movie market. "You can expect some slowdown, but that doesn't mean we're not going to make films. J.J. [Abrams] is busy making [Episode] IX. We have creative entities, including [Game of Thrones creators David] Benioff and [D.B.] Weiss, who are developing sagas of their own, which we haven't been specific about. And we are just at the point where we're going to start making decisions about what comes next after J.J.'s. But I think we're going to be a little bit more careful about volume and timing. And the buck stops here on that." While a breakneck release schedule has made Disney's Marvel superhero movies a global economic force, annual Star Wars releases have led to diminishing returns for a series that has historically led to record-breaking revenue. Solo: A Star Wars Story, a film whose initial production budget was $250 million but inflated after director Ron Howard reshot most of the footage, has grossed approximately $383 million. The assumption is that, after marketing costs and shared revenue with movie theaters, Solo lost a significant sum of money for Disney. The obvious conclusion: the audience isn't hungry for a new Star Wars movie every year. All the spin-offs like the announced Boba Fett and rumored Obi Wan Kenobi movies, not to mention the additional trilogies from Beinoff and Weiss, and Star Wars: The Last Jedi director Rian Johnson, seem like projects that should be spaced out - if they're made at all. Disney has been forced to acknowledge that part of what's kept Star Wars successful for over 40 years is scarcity. In the binge media landscape of the 2010s, Star Wars remains the ultimate longtail product. The original trilogy - even in its mangled Special Edition form - is still good, still in wide circulation, and therefore still something that people have wanted to consume. That ubiquity has simultaneously sustained almost 30 years of ancillary creativity: books, comics, games, toys, and more have thrived thanks to continued interest in the vintage movies. Simultaneously, the irregularity of actual movie releases in the past has created a singular hunger for new material in the audience. The Phantom Menace and The Force Awakens broke box office records not just because people really like Star Wars, but because they were desperate for new work in its original medium after decades-long gaps. Iger and Lucasfilm seem to have finally seen the light: if you want a $4 billion creative enterprise sustained by a famished audience to last, you can't give that audience a feast.